In a battle of nationally ranked Region VI foes, the No. 22 ranked Barton Community College men’s tennis team was no match for the No. 3 ranked Saints of Seward County Community College falling 8-1 Tuesday at Great Bend’s Veteran’s Memorial Park tennis courts. The loss dropped Barton to 1-3 on the season while Seward County stayed perfect on the year at 3-0. The No. 2 duo of Dominic Fabiano and Matthew Rochat picked up the lone Barton victory dismantling Seward’s Alvaro Rengifo and Felipe Casares 8-4. Getting shell shocked in the No. 1 duo match, Alvaro Martinez and Vitor Schuler were no match for the No. 7 ranked tandem of Ronzai Saurombe and Vitor Galvao 8-1. It didn’t get much better in the third doubles match of the day as Trevor Carey and Tristan Jones were blanked 8-0 by the Saint’s Tare Mariga and Paul Arslanian. Much like the women’s action on the East courts, things didn’t fare well on the West courts in the singles matches as Barton was outscored 72-7. Martinez won the most games getting three off of Seward’s Saurombe but the No. 10 ranked player put away Martinez 6-0, 6-3. The No. 2 singles match was another tall task for the Cougars as Schuler fell 6-1, 6-0 to Galvao who is just four spots behind Saurombe in the national rankings at No. 14. Fabiano’s No. 3 match was much like Schuler’s in falling 6-1, 6-0 to the Saints Rengifo. Facing the third Saints player in the national rankings, Rochat fell 6-0, 6-1 in the No. 4 singles to No. 31 ranked Casares while Carey dropped the No. 5 singles by an identical score to Mariga. Jones finished up the day in the No. 6 singles but Arslanian made quick work of the match winning with a pair of 6-0 sets. 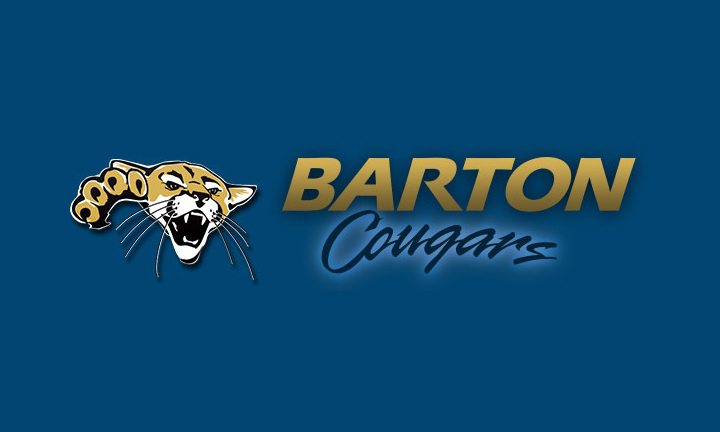 Barton’s next action will come Saturday, April 4, as the Cougars head to Newton, Kansas, for a 3:00 p.m. duel with Ottawa University.